My new book, Non-Democratic Politics: Authoritarianism, Dictatorship, and Democratization has been out for a few weeks (Palgrave, Amazon). For the usual vaguely superstitious reasons, I did not want to make an announcement until I had a copy in my hands, but now I do. Just in time for the holidays! I confess that I feel a bit ambivalent about the book’s publication. On the one hand, I’m of course glad the book is finally out in the wild; it’s been a long process, and it’s great to be able to touch and see the physical result of my work, and to know that at least some other people will read it. (Much better scholars of authoritarian politics than me also said some nice things about it in the back cover, which is extremely gratifying). Moreover, if you have followed this blog, you will find that some material in the book elaborates and supports many things I have said here more informally (on cults of personality, propaganda, robust action in the Franco regime, the history of political regimes, the Saudi monarchy, etc. ); one reason I wrote the book was to be able to put together in a reasonably coherent way my thoughts on these subjects, and I felt encouraged enough by some of the reaction to my writing here to think that I had something to say. (Without this blog, this book probably would not exist; thank you readers!) And since I teach this material here at Vic, the result should be useful as a textbook. (If you teach classes on non-democratic politics do consider the book for use in your course!). But I also feel that the book should be seen as “version 0.1” of what I really wanted to do. There was more that I wanted to write, and there are things I already want to add or revise (partly in response to current events, partly in response to learning new things), though I will only be able to do this if Palgrave decides there’s enough demand for a second edition. If I had more contractual leeway (and academic clout) I would put the whole thing in my Github repository and make it into an evolving work, adding or deleting material over time as I learn more, or correcting errors as they are brought to my attention, and releasing new versions every so often. But I don’t have that kind of leeway or clout yet (perhaps in the future – we’ll see); and traditional publication still offers some advantages (including dedicated peer review, from which I benefited a lot. Thank you, anonymous reviewers, whoever you are, for helping me improve this book). In lieu of putting the entire work online, however, I have created a website where all the charts and data in the book are available, and where I can give free rein to my love of ggplot2 graphs and data art. The site (https://xmarquez.github.io/AuthoritarianismBook/) contains replication code for all the figures and tables in the book, natural-language explanations of the code, and full documentation for all the datasets, and is to boot available for download as a single R package. It also contains some extensions of the figures in the book, including huge vertical graphs of the kind that sometimes appear in this blog but could never fit in a normal book. My hope is that people can use this package (and the associated website) to easily do their own exploratory data analysis on the topic. I have tried to make it as user-friendly as possible for people with little experience using R; and I intend to update it regularly and add new features and corrections. Check it out! The hardcover is unfortunately priced (I don’t recommend you buy it, unless you’re an academic library), and I think even the paperback should be cheaper, but I don’t make those decisions. 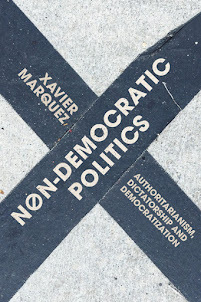 Nevertheless, if you have enjoyed this blog in the past, and would like to see how many of the aspects of non-democratic politics I have discussed here fit together, or you simply wish to learn more about non-democratic politics, consider buying it! Normal service on this blog will resume shortly. Hi Xavier. Hoy can I buy the book ? Love, your uncle Xavier. Congratulations Xavier! I look forward to reading the book and hope to take advantage of your making the dataset available on github. Will there be an electronic version available (preferably Kindle)? Thanks jmeasor! I don't know if there's going to be an ebook version - there isn't one now, as far as I know, though I'm hoping one will be released soon. Thanks Xavier, I'll have to order a hard copy then! Thanks for the feedback and I'd only encourage you to try to push your editor to have an ebook distributed.